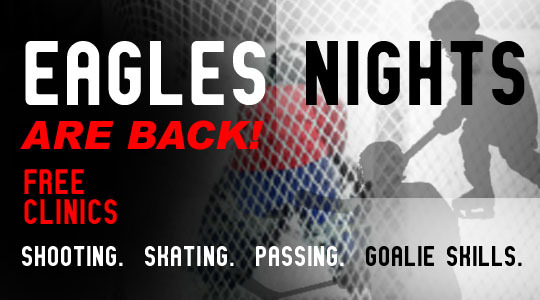 Eagle’s Nights are Back and Better than Ever! To all Squirt and PeeWee House and Travel Teams: Monroe County Youth Hockey is providing FREE clinics for all the Squirt and PeeWee aged teams on select Monday nights. These will focus on skill development and drills that the players may not encounter in their weekly practices. These sessions are designed to enhance the development of all players, so coaches, please encourage the players on your teams to attend. These will be added to your teams’ online schedules. For the player sessions, please have all players and goalies attend—even though these player sessions will focus more on skating, passing, skill development (which is also important for goalies), there will also be drills mixed into these sessions with shooting, so goalies are encouraged to attend. Also, for goalies, once every month or so, there will be a GOALIE ONLY session and this session should be attended by goalies only and will involve all goalie-specific drills and be led by a professional goalie instructor. Development of our younger players is a priority at MCYH—this opportunity may not exist at other organizations—remind your players to take advantage of this opportunity.